Gadzooks! There be witches everywhere. “Häxan”, “The Seventh Seal”, a history programme about the Salem witch hunt, and a stage production of "The Witch of Blackbird Pond". Will these witches never learn? 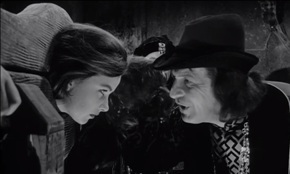 Yet another one is seen here receiving her just desserts in “Cry of the Banshee”. 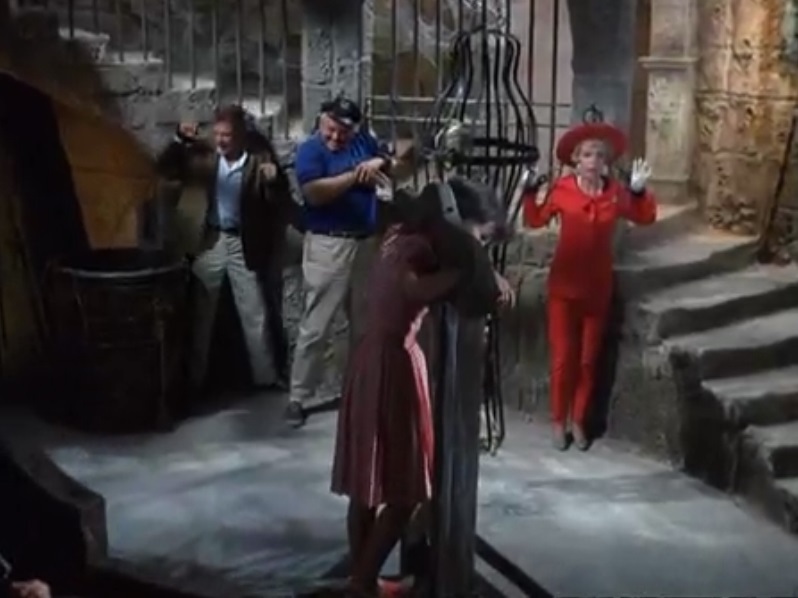 A couple of accused witches (including Vera Miles) are regretting applying to go on "Fantasy Island" in their search for good old fashioned moral values. 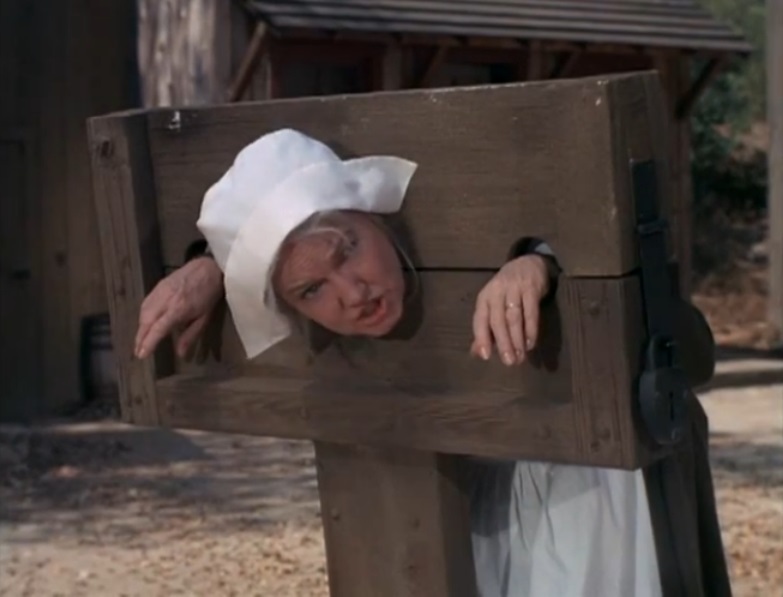 A trip back in time to the 17th century in "Bewitched". I do have a soft spot for puritans. Strict, judgmental, and firm believers in redemption through public humiliation. What's not to like? A witch makes a guest appearance on "The Late Show" to complain about the over-use of the expression "witch hunt". From a Finnish witch film, called "Tulen Morsian". 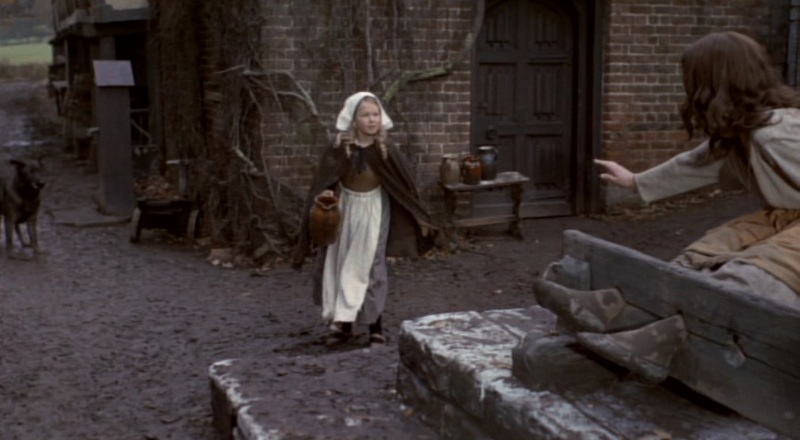 A school trip to Salem results in accusations of witchcraft against "Sabrina, the Teenage Witch". First Jenny is pilloried for protecting Sabrina, then Libby is pilloried for making false accusations. 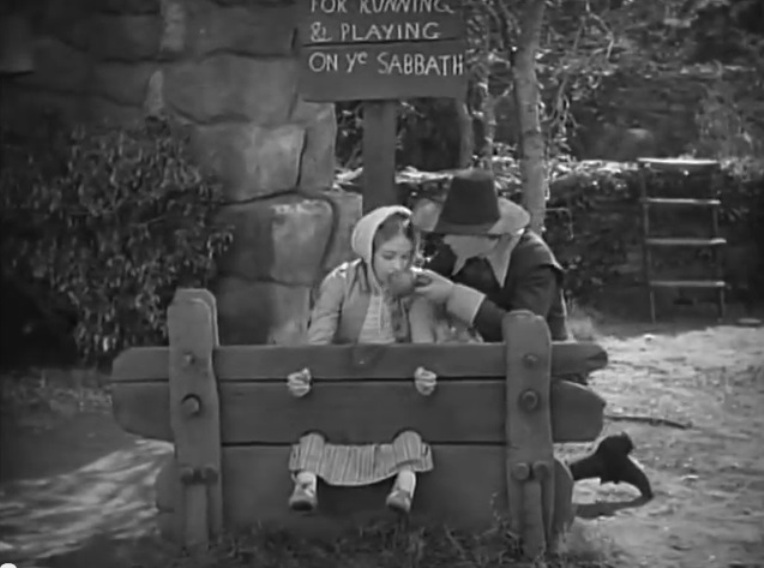 Ironically Sabrina (who is actually a witch) goes unpunished. It seems so unfair. More puritan justice. 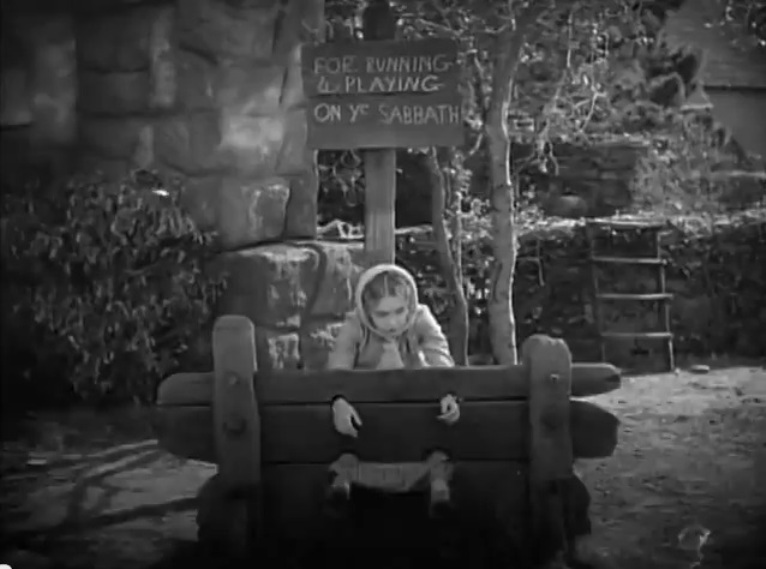 Lillian Gish cooling her heels in an early version of "The Scarlet Letter". 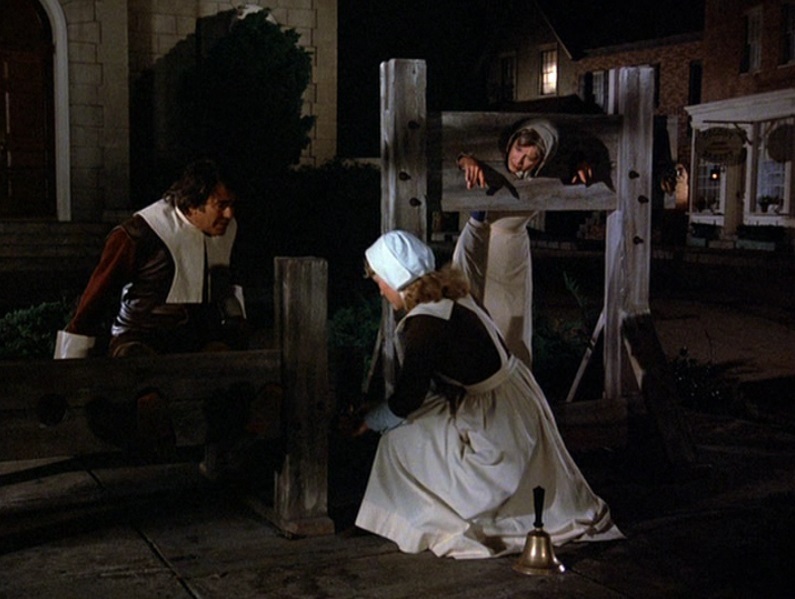 This depicts a brush with the law in her youth (regrettably omitted from subsequent versions), not the more famous scene when she later stood on (but alas not in) the pillory. 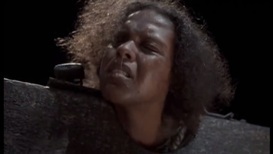 Continuing this theme, these next pictures are from an American TV drama, "Salem". The puritans disapproved of cosmetics and, in this case, perhaps with some justification. Time Travelling Bong is a US TV comedy, which does what it says on the tin. 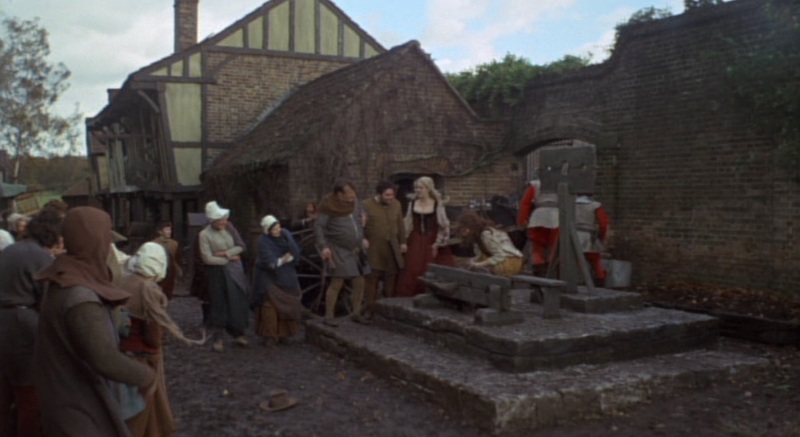 In this episode, our inept time travellers find themselves in 17th century Salem on the receiving end of puritan justice. 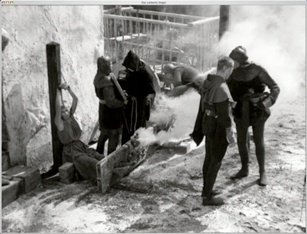 Next some scenes from “A Chinese Torture Chamber Story”. Our oriental friends take a dim view of those who neglect to return their library books on time. From a German comedy film (no, that is not an oxymoron) called "Prinz Blechleber und der Fluch der Ahnen". In the torture chamber of Kröd Mändoon, where he is attempting to extract tears from pagans. She got off lightly compared to the audience. 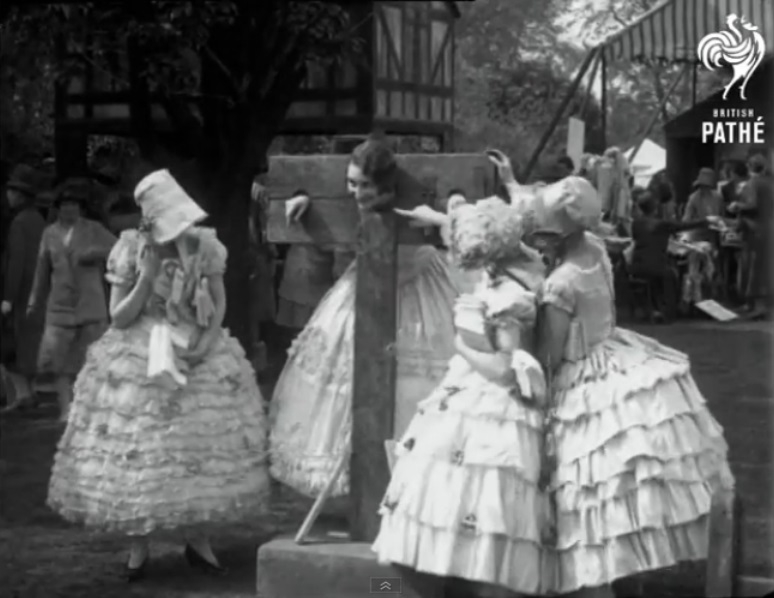 An "Old English Garden Fete", from a 1927 British Pathé newsreel. 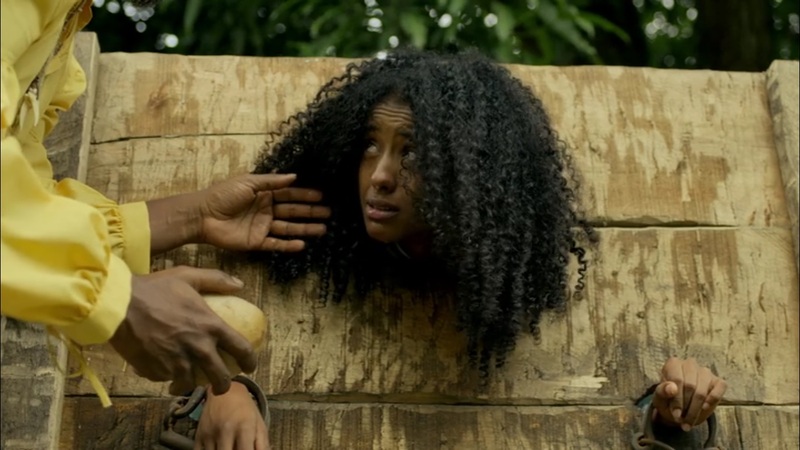 La Esclava Blanca ("the white slave"), a Colombian TV series. Paul et Virginie, a French television programme set in one of their colonies. Quanto Vale Ou É Por Quilo? ("What is it worth? 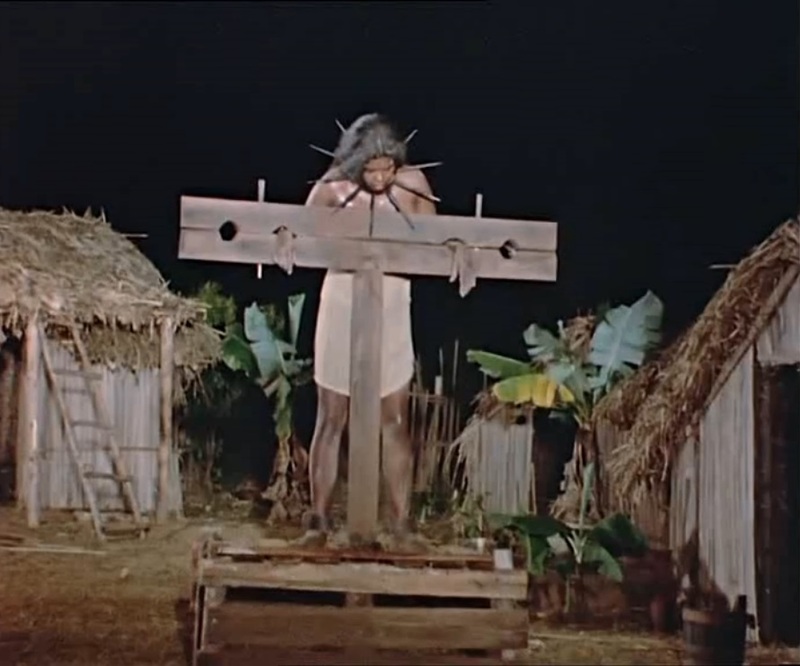 ), a Brazilian film which draws a parallel between life in the 18th century and modern Brazil. In "Tales from the Crypt" (episode "Let the Punishment Fit the Crime"), Catherine O'Hara plays a smart city lawyer who finds herself in a small town where they have traditional views on crime and punishment. 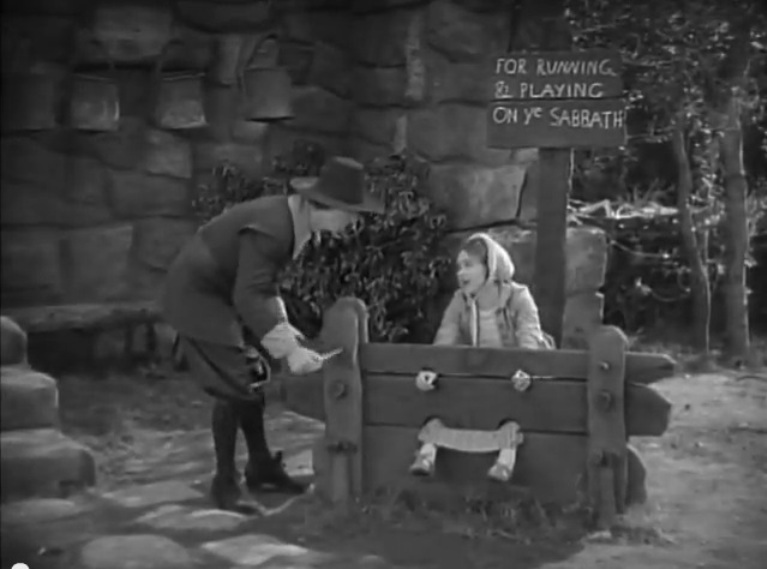 A 1935 British comedy set in 1710, called "Me and Marlborough". (That's John Churchill, 1st Duke of Marlborough, hero of the War of the Spanish Succession, and ancestor of Winston Churchill.) 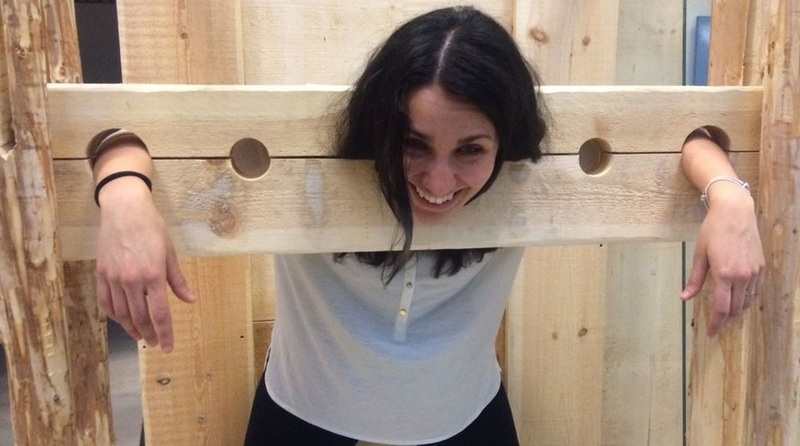 Our heroine has been put in the stocks following her participation in a tavern brawl. This is doubly unfortunate for her as she was about to get married (hence the wedding dress). 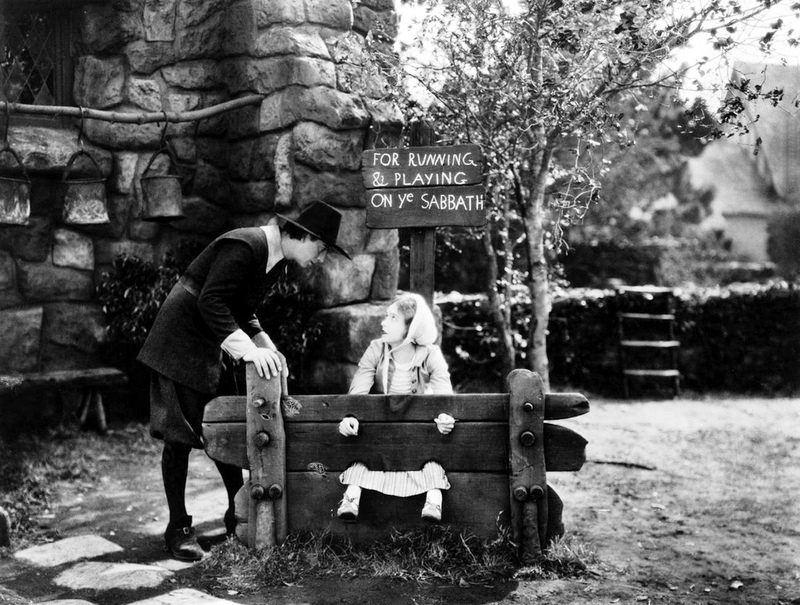 Her prospective husband finds her in the stocks, not perhaps the best start to a marriage. After a failed attempt to free his fiancée, he sits beside her and they kiss. Its so romantic (sniffle). 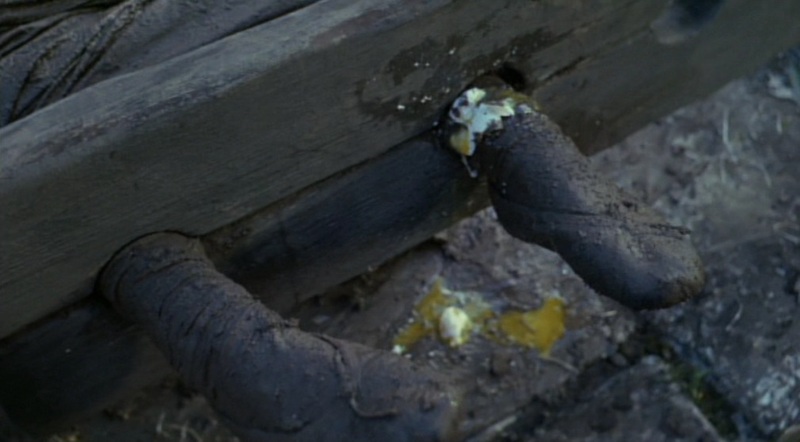 Tilly Trotter, the eponymous heroine of Catherine Cookson’s novel, has got herself in a pickle......and eggs......and rotten fruit......and whatever else was handy at the time. When I volunteered to help at the local renfaire, nobody mentioned this! I’ve changed my mind. Let me out of here at once! Er, pretty please? Don’t you dare throw that at me! Yuck!! At least its supposed to be good for the complexion. Not all pillories are found above ground. Some of them have evolved burrowing propensities and build their nests in torture chambers. This one found its way into the “Tower of London”, where it can be seen getting to grips with Sandra Knight. 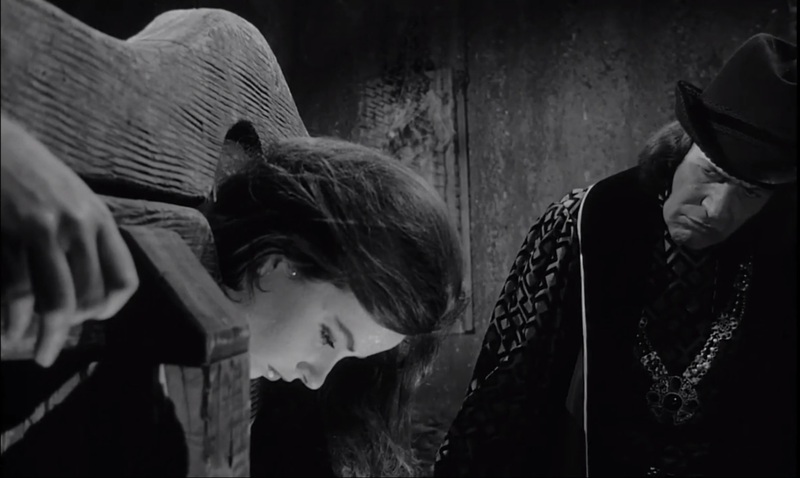 This is also a demonstration of the ancient art of gloating by the master, Vincent Price. 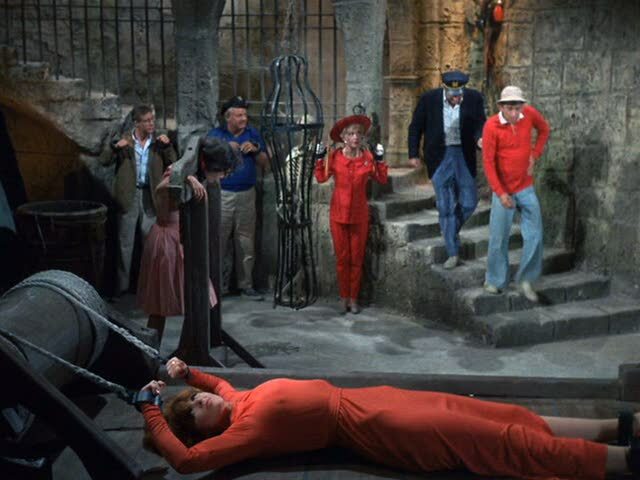 This torture chamber is on “Gilligan's Island”, which I believe is somewhere off the coast of the American colonies. 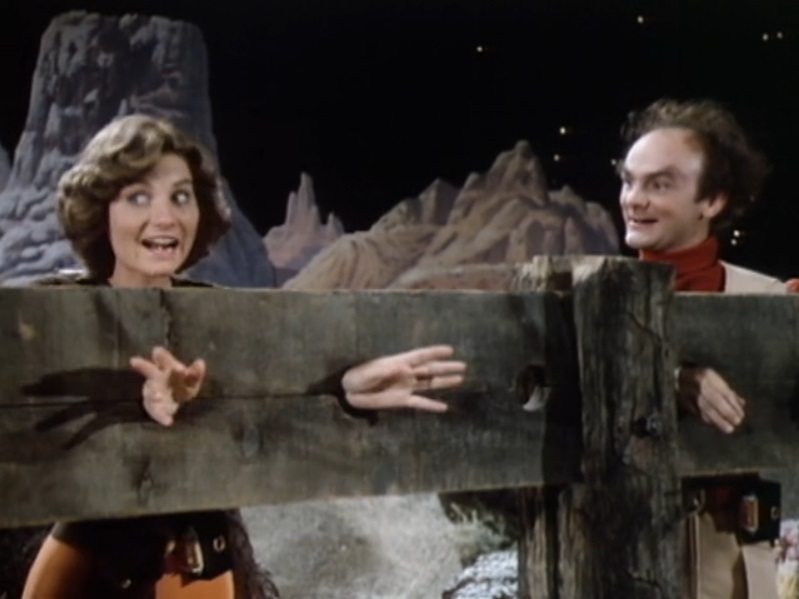 Here we see Dawn Wells in the pillory (and Tina Louise on the rack). Here is Olive Sturgess about to get her feathers singed in “The Raven”. A different torture chamber, but doesn't that pillory look suspiciously similar to the one in the Tower of London? 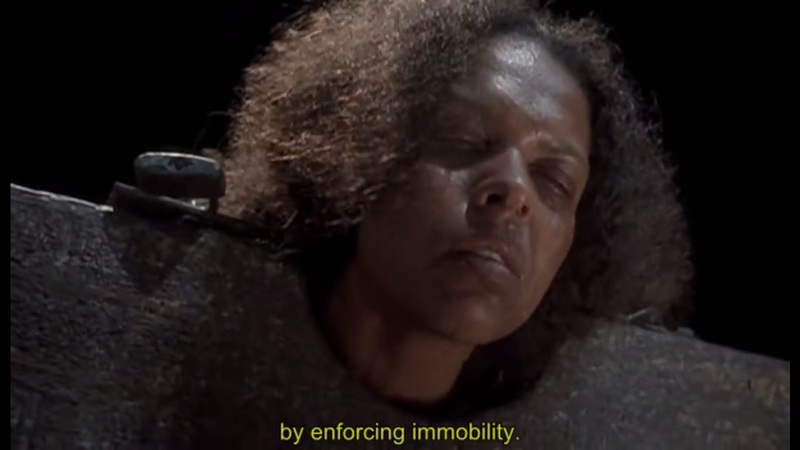 A Slovakian TV chat show called Petra Marcina, in which a guest actress (Henriety Mickovicovej) is put in a shrew's fiddle, and has a ball and chain shackled to her ankle. These are from a British TV game show called "The Door", in which contestants have to overcome various physical and mental challenges. 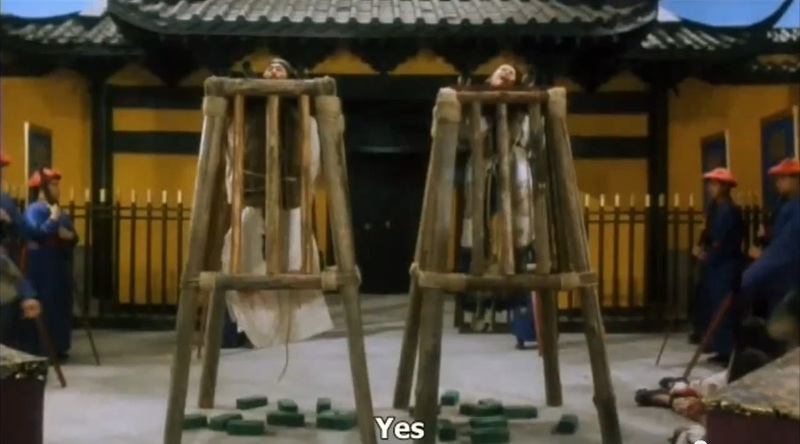 Here we see some contestants locked in cages with their necks in stocks. They have to work out how get the keys to release themselves before an assortment of insects, maggots etc are dropped on their heads. None of them manage to avoid the creepy-crawlies. These are from a British TV programme called "Don't Try This At Home". For the benefit of my non-British viewers, all shopping malls here are equipped with stocks to deter shoplifting. Here we see two housewives who forgot to pay for their purchases. A visit to a health club leads to a few problems for one contestant on the "Fit Farm" (another British TV program), when she is apprehended having a sneaky cigarette. Warning: smoking can be hazardous to your dignity. In the US version of "Big Brother", assorted egomaniacs and narcissists are placed in a row of pillories. The pillories are painted as dollar bills and, in case that symbolism is too subtle, the contestants are periodically smacked across the face with a bunch of banknotes. Each is holding a briefcase, and the winner is whoever can remain in the pillory longest while keeping hold of their briefcase. These vidcaps are from a YouTube exclusive, created by actress Melissa Cline as part of her online resume. Melissa tries on a yoke only to find out that there is no key. How she managed to lock herself in a yoke is not explained. As you can imagine, her predicament and lack of stoicism generate much hilarity. Finally, a few miscellaneous pictures. 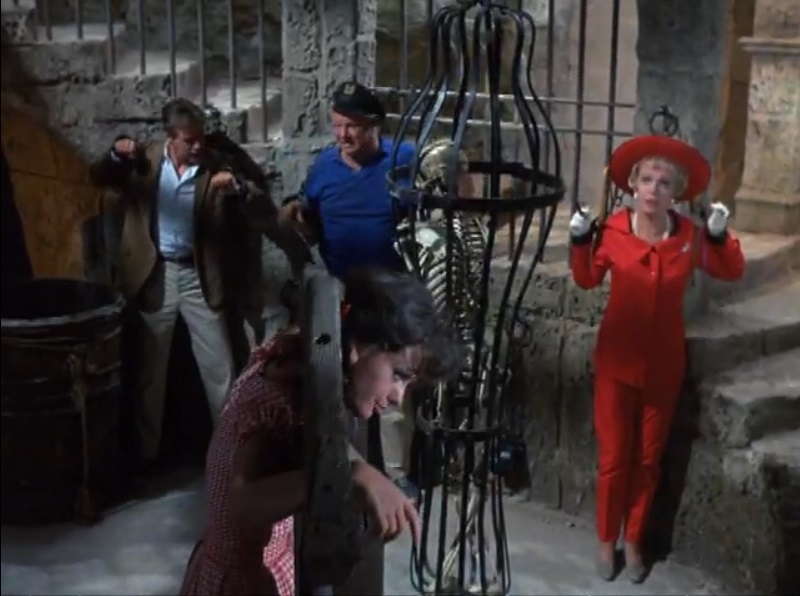 A bit of a stretch for Mala Powers in "Flight of the Lost Balloon"
A thoughtful moment for Annette Funicello in that unforgettable classic "Doctor Goldfoot and the Bikini Machine". 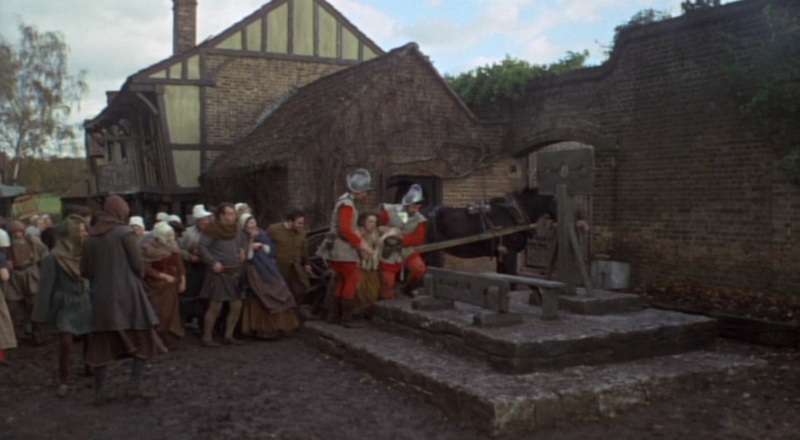 Yes, its the same pillory again. From a British TV programme called "The Wild House". She's just about to get tomatoed, hence the worried look. From an American TV programme called "Colonial House", where volunteers get to experience the realities of puritan life. 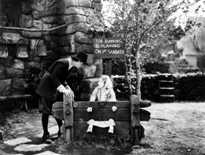 This is a publicity photo; no pillories are used in the programme. From a film called "Lock up your daughters". The locals take this advice rather literally. "An-Magritt", a Norwegian film. 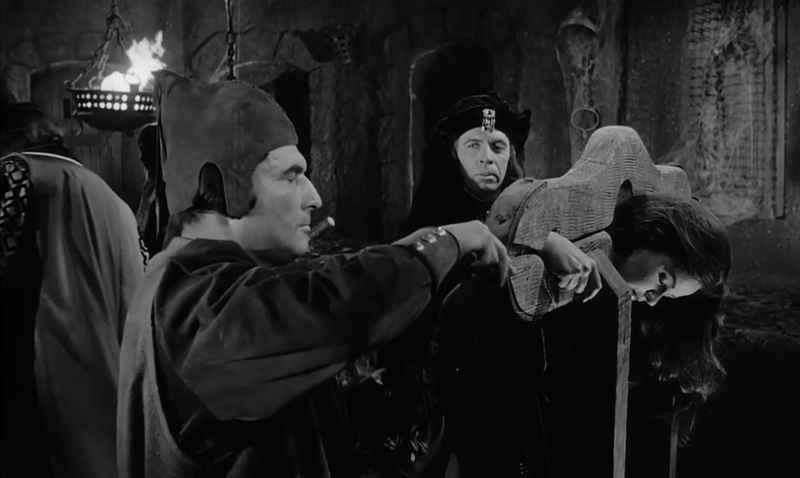 The manacles seem less effective than handholes; I can see why they never caught on. "Babes in Toyland", a sickeningly twee Laurel and Hardy film. 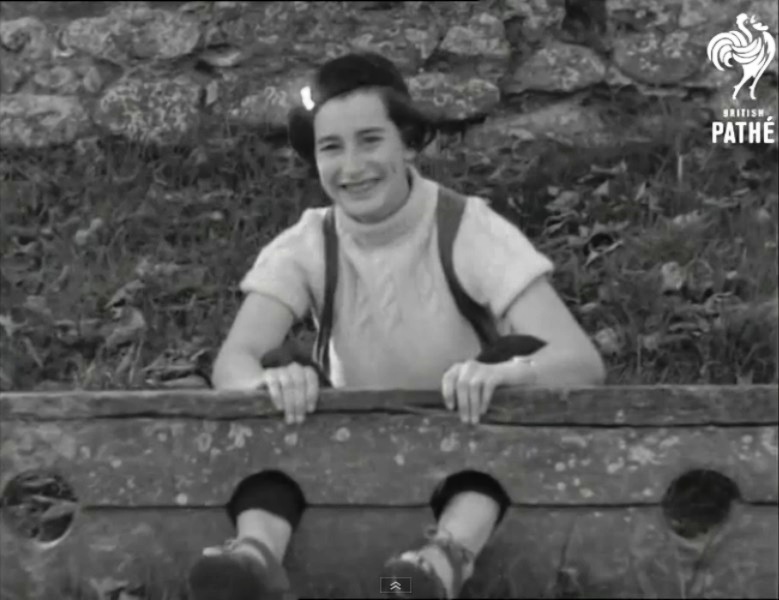 "Calling All Tars", a British Pathé newsreel film featuring a hiker who tries out the village stocks. "A Escrava Isaura", a Brazilian TV drama. A shockingly bad film called "Golden Temple Amazons". 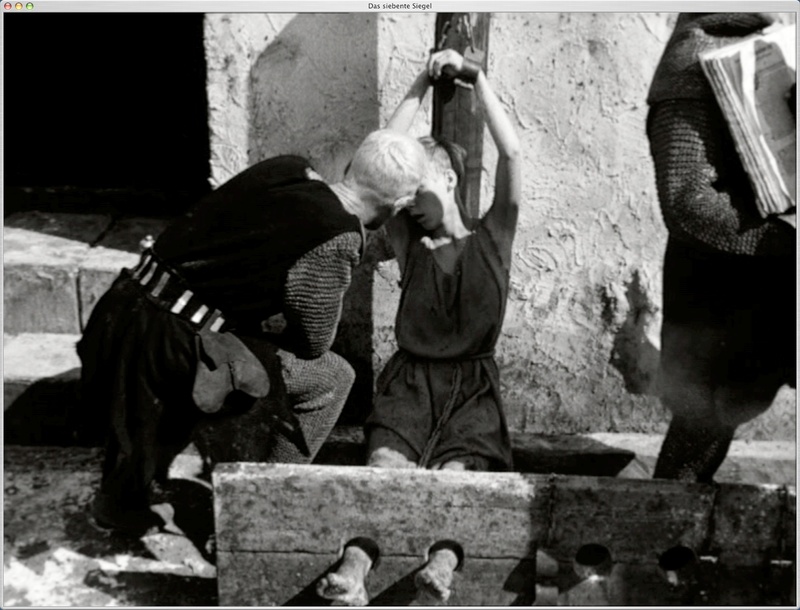 There seems to be an inverse ratio between the quality of a film and the chances of stocks or pillories being featured. I take grave offence at this. A Polish television miniseries, which translates as "Helmets and Hoods". 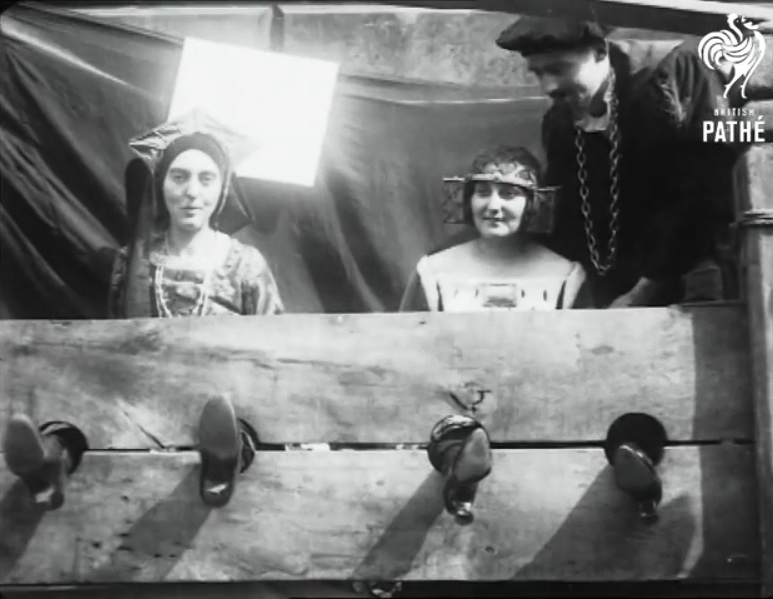 A 1923 British Pathé newsreel called "Our Oldest Hospital", which features a medieval fair commemorating the 800th anniversary of St. Bartholomew's Hospital in London. From a television show called "Star Command". Its reassuring to learn that other planets also have stocks. From the television series "Superboy". Chopping off all her extremities seems like overkill, quite literally. A reporter visits a museum on a Swedish television programme. From a stage production of "Intimate Exchanges", a play by Alan Ayckbourn. Zomer van Drenthe, a Dutch television reporter visits a museum. Die Burg, a German reality TV show set in a medieval castle. A modern stage adaptation of an allegorical 16th century play by David Lyndsay generally known as "The Three Estates" or, in the original Scots, "Ane Satyre of the Thrie Estaitis".